In 1978 Wire made their debut in the USA playing at CBGBs in NYC for 5 nights. When this engagement was completed I flew to LA to meet my girlfriend of the time and have 2 weeks vacation staying with friends. At the end of this I flew back to New York to hangout. On the return daytime flight the visibility was perfect and I experienced a stunning aerial view of the Rockies and the vast Mid-Western plains…this was the inspiration for the first part of the text. I studied Geography at both O & A level and developed a fascination for maps and their reading… On this occasion one was able to read the epic landscape…vast gorges, an incomparable 2D flatness, meandering rivers, levees, oxbow lakes etc….with an unrelenting gridded road system imposed on top). The two pieces of writing dovetailed to produce one text on 2 locations…the title was conceptual… notionally the very centre of the Mid-west…I guessed and found a place called Centreville nearby… this seemed appropriate, poetical yet hardly scientific! I knew a geographer had to have written the song. Map Ref. 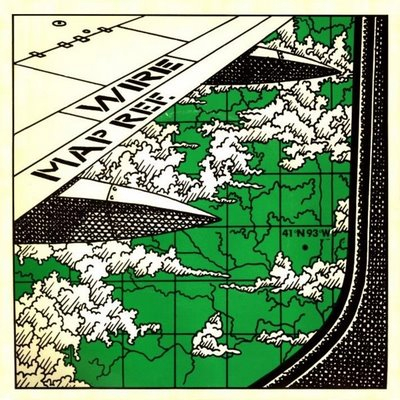 41°N 93°W was Wire’s sixth single, taken from their third album (one of my favorite albums of all time), 154. The cover for the single opens this post. Other album covers with maps here. Maps and cartography are not particularly popular as song themes. But there is the Longitude and Latitude Song (MP3 file here). Careful or you’ll be singing this one out loud in your cubicle. Performed by Tom Glazer and Dottie Evans, and written by Hy Zaret, the song is one of a series of sciency tunes, aimed to inspire Sputnik-era kiddies, on the Space Songs album, recorded in 1959. Jeff Poskanzer’s terrific Singing Science web page has all the tracks from Space Songs, as well as the tracks from subsequent albums Energy and Motion Songs (“Ultraviolet and Infrared”), Experiment Songs (“We Know the Air is There”), Weather Songs (“The Water Cycle Song”), Nature Songs (“Song of the Rocks”), and More Nature Songs (“What is an Animal”). Absent from the albums are other potential map songs: “Which Datum Do You Use?” “Project Me,” “The Large Scale/Small Scale Polka,” “Your Love is like a Decorative Font,” “She’s Natural Breaks, I’m Quantiles,” and “The Symbols of my Love are Abstract Shapes in a Selection of Different Hues Corresponding to Qualitative Data Variation.” I’ll stop now. A quick search of a few open-source music databases (FreeDB and MusicBrainz) results in hundreds of songs with map in the title. Not many latitude/longitude songs, though. 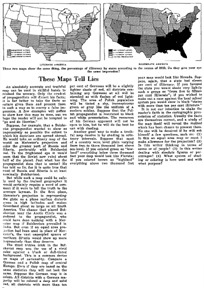 There are also quite a few mappy band names: The Maps, Swell Maps, Maps and Diagrams, Maps of the Heart (blah! ), Maps and Atlases, Relief Maps, The Plat Maps, Map, Map of Wyoming, Map of the World, Town Map, The Map, Map of Africa, Map of Hell, Penguin Map Mijinko, The Search Map, Book of Maps, Minus a Map, Map the Growth, Map of July, Days without Maps, Mind Maps, Maps of Norway, and Not on the Map. The potentially evil, formerly-open-source music database Gracenote has a moderately interesting Music Maps page, which uses recent CD lookup data to map the geography of popular music. And, of course, the excellent World Beat Music map of the world over at Strange Maps. 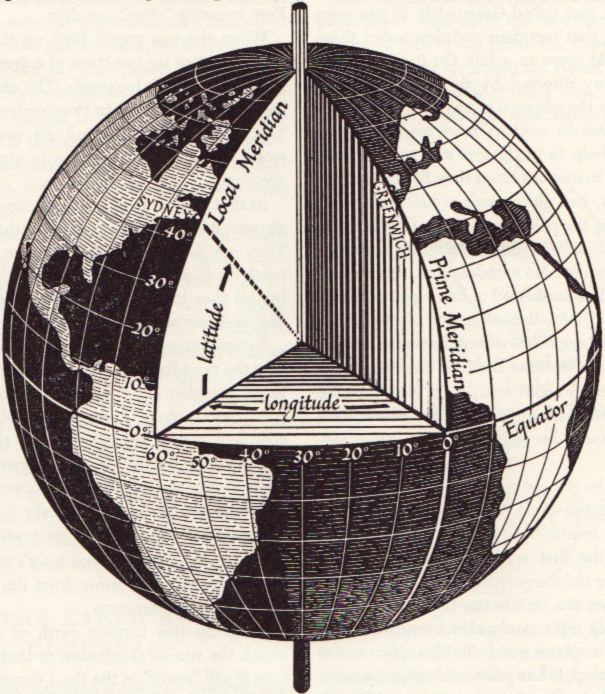 Latitude/longitude graphic from David Greenhood’s classic book Mapping. What if the world was spherical, but it didn’t matter? Most of you have been unable to avoid the flat-earth kerfuffle on the day-time talk show The View. Most maps show the earth as flat. Map projection is the process whereby the surface of the 3D earth is transformed into 2 dimensions. A flat earth is usually more useful than a spherical one. Awhile back I made a flat-earth globe for folks like Ms. Shepherd. It is a globe designed for niche cosmologies. 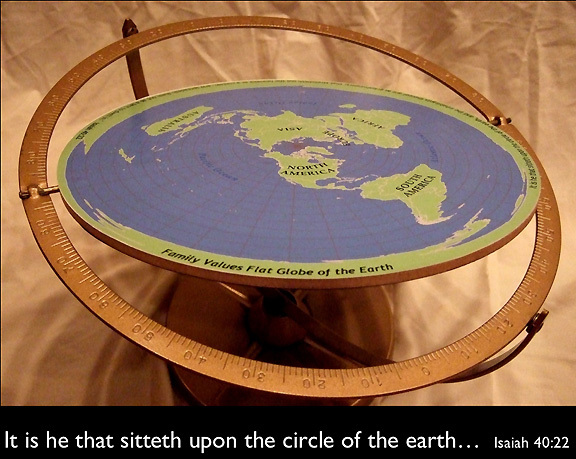 More images and basic instructions for making your own flat-earth globe below.